In both her professional and personal lives, fashion is Marta Krauze’s favourite form of communication. 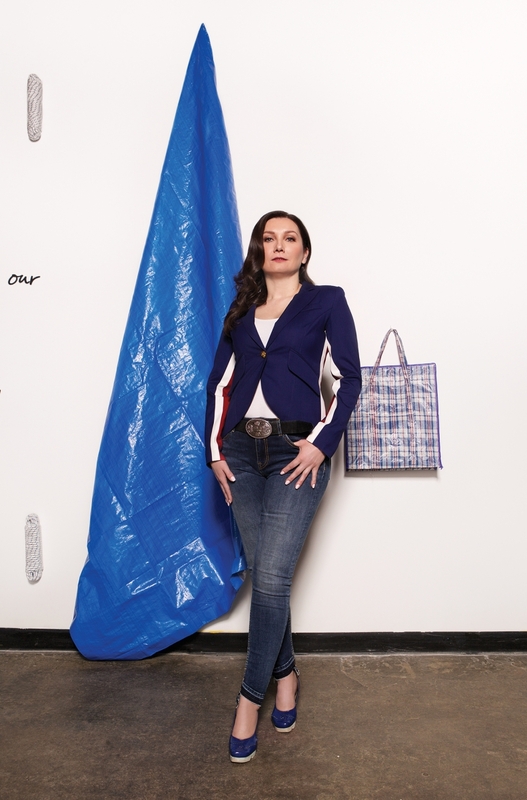 When Marta Krauze immigrated to Canada from Poland 20 years ago, her European sense of style set her apart. She first lived in Fort McMurray and struggled to accommodate her wardrobe to a new atmosphere and social climate. But after eight years in Edmonton, she can’t imagine being anywhere else, and her style is an amalgamation of her history. Krauze is now the VP of Finance at DynaLIFE Medical Labs, which was recognized by Mediacorp Canada Inc. as one of Alberta’s Top 70 Employers in 2017. In her professional life, Krauze aims for versatile looks that can effortlessly take her from day to night. She also isn’t afraid to make a bold statement with an outfit – in fact, that’s her goal. Krauze feels most comfortable when her clothes send a message about her individuality and, if she needs a confidence boost, she turns to her extensive closet first. She’s also a pro at spotting others that feel at home in their clothes, and savours finding new approaches to style that speak to her. Krauze insists that “fashion is like a secret language.” And it’s clear she’s fluent in it. I’ve always been very jealous of people with artistic talent. I could never paint; I didn’t learn music. So dressing myself more uniquely has always been my way of tapping in to my creative side. Is fashion a way that you bring your personality into your professional life? Absolutely. If you talk to people at my office, they know exactly what mood I’m in as soon as I walk into the room, based on what I’m wearing. If I’m in a meeting, I know my outfit needs to reflect that, but I always aim to express my individuality through clothing. Of course, I have professional, polished looks that are very planned, structured, sometimes rigid. Other times I feel spontaneous, and dress in flowing, comfortable fabrics – almost bohemian. It all depends on what I want to achieve that day. How does your style change when you’re not in a professional setting? I’m all about versatility. I try to choose outfits that can easily transition from a professional setting into to a more casual one. For example, I might wear a suit to work, but if I’m going out afterwards, I can quickly convert the look by taking off the blazer, and maybe dressing it up with a funky scarf or a cool denim jacket. Professional spaces are traditionally masculine. What role does fashion play for you as a professional woman? I find it empowering. In my career, I’m often the centre of attention. When I know a lot of eyes will be on me, what I’m wearing can give me a huge confidence boost. What are your go-to outfits when you want to feel powerful? One of my favourites is a black-collared shirt and super-masculine suit with a set of cufflinks. Another day, I might wear a red dress with a plunging neckline and high heels. Always high heels. How has living in Poland influenced your style? In Europe, we seem to pay a lot of attention to appearance, and it isn’t always a good thing since it can be restricting. Albertans seems to be more relaxed and tolerant, and it gives me a lot of freedom to express myself. That’s what getting dressed is all about for me.